This one is for the people who live in Columbia: vote. If today is your village election, don't skip it. Participate. Don't just let it glide by. If you live in Harper's Choice, I highly recommend Bob Fontaine for CA Rep. If you live in Oakland Mills, you can read more here about my opinion on the amendments on the ballot. In short, let's not vote to diminish our right to vote. Really miss regular postings from Ms. Montague, by the way. Can you hear this, UB? We want you back in the blogosphere. This morning I'm nursing a bit of a migraine after an impromptu get together at The Second Chance engineered by my husband. Merely saying "it was a wonderful evening" doesn't come close to describing it. Elections are important. The reasons we work toward elections are more important. Keep your eyes and ears open because that work is ongoing. But take a moment every now and then to raise a glass with friends. You know what I would like? What I would really, really like? I'd like a day when I could get back to the regular business of this blog and not be compelled to write about the school system. Yeah, if we could have a day without power plays, hijinks and drama, that'd be great. Last night at the Board of Ed meeting, HCPSS Finance Director Beverly Davis unveiled the newest response in the dispute over the school system budget: a survey. 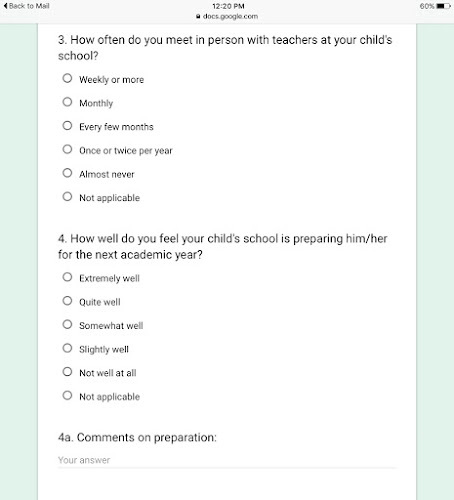 Yep, from the same people who brought you this survey which asked such loaded questions as "How well do you understand the benefits of standardized testing?" comes "Cut or Keep--you make the call!" No, no, no. That's not how this works. 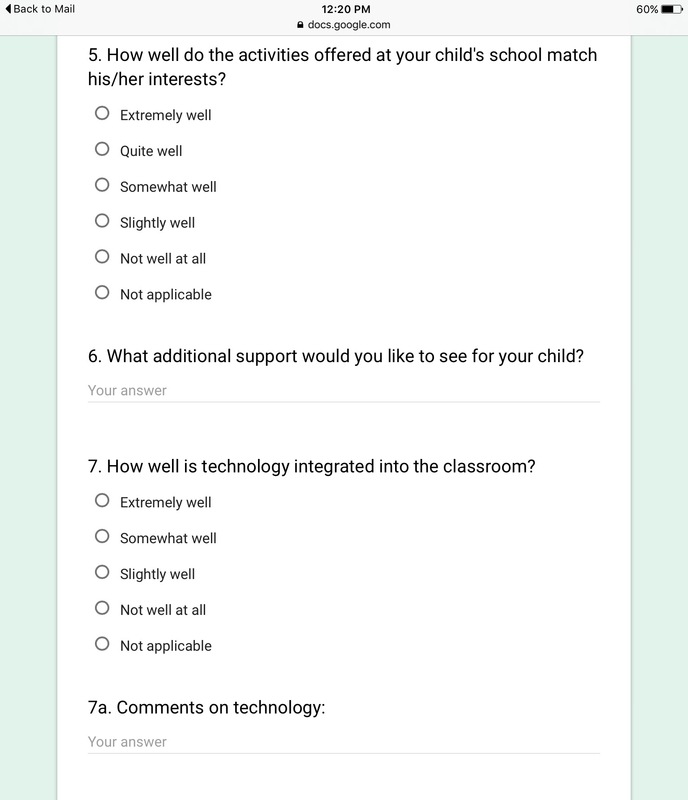 For one thing, for a survey to be valid it must be crafted by people who have the professional expertise to do so. For another, not everything in the budget is equal. Salaries and benefits for teachers--which are arrived upon as the result of negotiation--are an obligation the school system is contractually bound to honor. It's extremely likely that a survey of this sort will present items without this explanation, giving the appearance of a false equivalency. 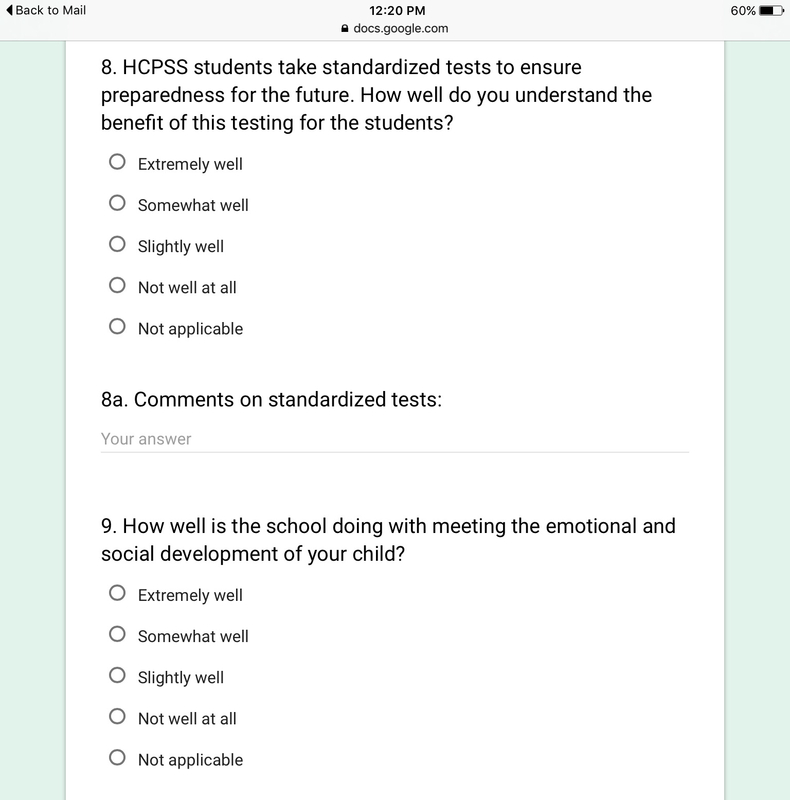 @LAPhilip @HCPSS Who was the author of this instrument and what is their background in survey research? I have another one. Why aren't we hearing the report of the Citizens Operating Budget Review Committee? Oh. That's right, the Board of Ed disbanded it. Even though the OBRC consisted of a number of people who understood budgets and understood the school system, it was deemed to be unhelpful. And remember, the Superintendent was loathe to give a full accounting to the general public because she said "you need an advanced degree" to understand it. But now predigested budget choices will be doled out to the general public and they don't even have to look at the actual budget. Now that's thoughtful. There's a legitimate budget work session today at the George Howard Building. That's where the nitty gritty of the real numbers should be emerging. (Or at least Councilman Greg Fox hopes so.) So there's no need for this hastily-prepared survey. The school system and county government have before them the business of communication and negotiation. While it is somewhat unusual that we are at this particular impasse, this is what the business of government looks like. 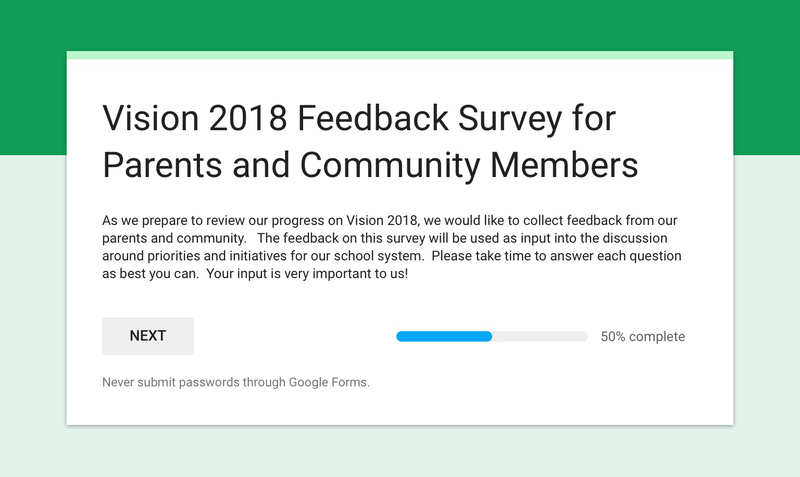 Don't take the survey. Just don't. If you have opinions about school budget priorities, send an email to the county council and copy in the school board. That's the most effective way for your voice to be heard right now. The survey is, at best, a distraction from the real business at hand. 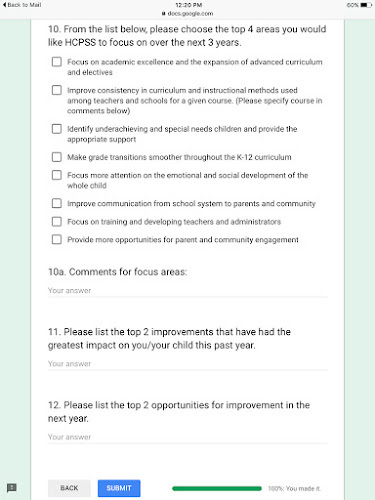 Besides, you already filled out a survey this week, an important one. On Tuesday. In the aftermath of the Board of Education election, local bloggers have had plenty to say. Why not? Private citizens have had plenty to say. There were important issues on the table here, issues which belong to the citizens of Howard County. That is why my post-election piece focused on what the desire for change on the school board was all about: working for something, not against. I am not aware of anyone whose desire was to burn something down. To the contrary, the overwhelming sentiment was a love for and belief in our school system, to want to work to make it better, to build it up. 1. I don't think that this is a time to make fun of, smear, name-call, cast aspersions, ridicule gleefully, lampoon--you get the picture. It isn't funny. It isn't helpful. I have an extremely low tolerance for that kind of behavior anyway, and under these circumstances it's in extremely poor taste. 2. Nor do I think this is a time to heap praises upon these candidates--if the praise is unjustified. Yes, everyone deserves to be thanked for their service. But don't say nice things that aren't true. While it may be salve to the wounds of the unelected, it does a singular disservice to those in our community who have suffered as a result of their work. In an effort to be evenhanded and sensible, please don't forget that our county is littered with victims of ill-treatment, dishonesty, and bad decisions. These victims come from every possible constituency: students, parents, teachers, paraeducators, staff, administrators, central office staff, even fellow board members and elected officials. Smoothing over this uncomfortable truth looks a lot like a choice to paint the incumbents, in their loss, as victims. To those who wish to pass judgement on fellow-citizens who feel passionately about a better board of education, I don't know what to say. I guess that you, or someone close to you, hasn't been hurt. Be grateful. To those who will be going off the board after the November election--thank you for your service. In the afterglow of yesterday's election, I glimpsed a post from a friend that was far from rosy. So I just got out of a meeting with a large number of colleagues and we've been given our layoff notice effective 6/30. So, if you know of any decent companies offering work for IT Business Analysts, Data Analysts and Product Managers, let me know and I'll pass them along. So I'm putting this out there to readers of this blog. What good is social capital if one doesn't use it for good? Let's get these people (especially my friend) some jobs. If you have leads/suggestions to pass along, post them in the comments section or email me at the address associated with the blog. With 110 of 124 precincts reporting, Kirsten Coombs, Christina Delmont-Small, Mavis Ellis, Janet Siddiqui, Vicky Cutroneo and Robert Miller were the top six vote-getters, respectively, and will advance to the Nov. 8 general election to compete for three seats on the school board. Miller led Corey Andrews, at 21 the youngest school board candidate, by five votes. Janet Siddiqui was the only incumbent to receive enough votes to move past Tuesday's primary. I saw a quote yesterday from a supporter of one of the incumbents that he was trying to fight back against anti-incumbent feeling. I think it's important to note that what made the challengers successful in this election was not that they were against something. It's because they were for something. Responsiveness. Accountability. Transparency. Working collaboratively with stakeholders. Supporting teachers. 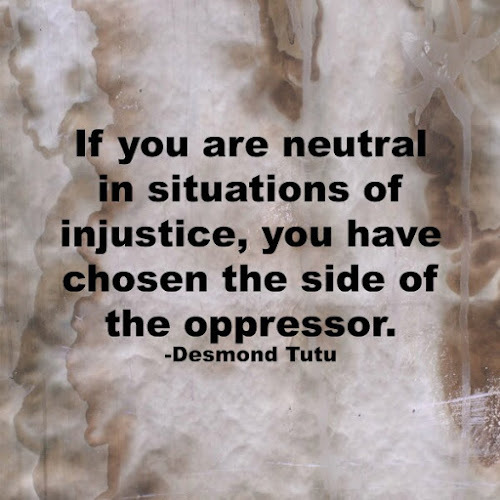 Giving voice to the vulnerable and voiceless. And above all, treating people with respect. These are things worth fighting for. Our community will be better because of everyone who worked for this: candidates, their families and supporters, members of HCEA, and those of The People's Voice. These ideas, these goals, spread from village green to village green (as it were) until the response from the community was magnified exponentially. (Yup, town²) Don't get me wrong. I'm not saying I invented this concept. I just gave the process a name when I started my blog. It's the people who really walk the walk who make good things happen. The primary election is over. The work of our school system continues: daily. I urge everyone to continue to be a positive force for good. Volunteer. Tutor. Go to board of ed meetings. Follow education issues in the newspaper and online. Keep your friends and neighbors informed about what is going on. Twelve hours from now I would normally be getting my blog post up, pouring a second cup of coffee and getting my family out the door. But tomorrow will be different. In twelve hours my family will be sleeping in and I will be standing at the polls in support of Kirsten Coombs for the Howard County Board of Education. My kind of advocacy usually comes in the form of a blog post or a well-timed letter. But every once in a while even I know that the time has come to move beyond doling out insight from a distance. Sometimes one must go to the meeting, give the public testimony, stand at the polls and meet new people in support of something bigger than oneself. In twelve hours that time will come again for me. As you are reading you are probably realizing that I wrote this twelve hours ago because I have not figured out a way to stand at the polls and blog at the same time. As I write my daughter is looking forward to watching "Dancing With The Stars", and my husband is playing the guitar while watching the Orioles game. At the George Howard Building the County Council is very likely about to endure a dog-and-pony show of budget testimony from school system employees who have no choice but to be there. Just another Monday evening in HoComd. It sounds like a perfectly ordinary evening, but it isn't. The balance of power could soon be shifting, and the opportunity for Howard County citizens to have a real voice in their school system could finally come into play. Right now, as I type, I feel the air around me crackle with the power of possibility. It could happen. If we choose to make it so. Twelve hours from now I may smile at you, say good morning, perhaps engage you in conversation. And twelve hours after that I'll be at home, watching election results come in and hoping for the best. Well, that's putting it mildly. I'll be highly invested in the outcome. And I'm not alone. Some incredibly good people have put themselves out there to work for a better board of ed. The clock is ticking. The time to take a stand for something bigger than ourselves is now. Today I'm sharing a letter from the Howard County Parents for School Music to the Howard County Council pertaining to the Superintendent's proposed budget. I am writing to you today with regard to the Howard County School System budget, currently under review by the County Council, on behalf of Howard County Parents for School Music, a service and advocacy organization representing music and arts interests in HCPSS. We were recently asked if we would be willing to support the full funding of this budget at the county and state level. 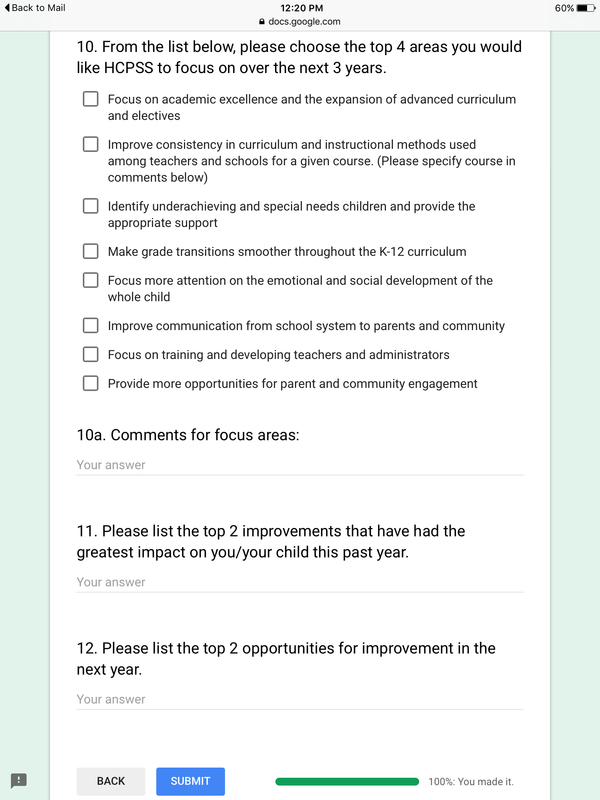 Upon first review, the answer was a resounding yes, increased teacher salaries, maintenance efforts, and funding for growing enrollment are all things we can get behind wholeheartedly. Unfortunately, upon doing our due diligence on the budget, we discovered that buried in this budget is an increase to fund the expansion of elementary world language. While on the surface we do not oppose this idea, what it actually belies is a plan to expand the Elementary School Model program into seven additional schools. This model has never been open for stakeholder input. It was implemented first at Title I schools, and only introduced to parents after the decision was made to implement it. The school system, in not clearly identifying this planned expansion, attempted to hide the plan as a need to hire more world language educators. We can view the lack of transparency on this issue as more of the same from an unresponsive Superintendent and Board of Education, and a clear attempt at gaining funding for a program without “risking” community input. We are sure that hearing that the school system has, once again, made a unilateral decision without stakeholder input is not a surprise to you. We are asking that you do anything in your authority to compel the school system to engage the community in a discussion of this program before being allowed to expand it. There are many components to the Elementary School Model, but we believe that the 25% reduction in Art and Music is one of the real drawbacks of the program. To illustrate the effect of this consider that for our youngest students this means a reduction of general music from two times a week for 30 minutes to once a week for 45 minutes. For Art teachers, whose class requires considerable set up and clean up time each week, this has dramatically reduced productive time for the class. Studies have consistently shown that arts education can play a critical role in closing the achievement gap, improving test scores, and enriching the lives of our students. This issue deserves community input. Imagine several years ago, when middle school Reading was being debated in the county, if this decision had been made without community input. While the final decision did not satisfy all, it was made with the full consideration of all stakeholders. The decision to dramatically change the way we educate our youngest students also deserves to have this input from the community. If you agree, please consider not funding this portion of the budget request until that input is sought. The people of Howard County are desperate to have their concerns heard, and we at Howard County Parents for School Music join them in that fight. Our school system’s reputation is critical to the economic and social success of our beloved Howard County. Please join us in attempting to restore that reputation by holding the Superintendent and Board of Education accountable for budget transparency and community input. Yesterday something caught my eye in a Baltimore Sun article about the Sandtown neighborhood of Baltimore, the late Freddie Gray's neighborhood. If we are serious about doing something about the achievement gap in Howard County the last thing we want to do is compromise arts education. Keep in mind that absolutely no data has been shared on the value of the Elementary School Model, whereas there is plentiful data on how a robust arts education benefits students from early childhood onwards. If we are serious about supporting our children and our schools in Howard County, the last thing we want to do is cut the community out of the process as we set financial priorities. If you are not in favor of this budget, let the County Council know why. And use your voice and your vote tomorrow to choose a better board of education. Call it gamesmanship, upmanship, or an elaborate game of Chicken, but what is going on here has very real consequences for our children and our community. Dr. Foose's response to Mr. Kittleman's proposal has been highly critical. The Board of Education's response (at Thursday's board meeting) was to float ideas like increasing class sizes and instituting furlough days. Didn't your teachers remind you time and again to read the directions before you do your work? Read the excerpt from the budget again. The County Executive is directing full funding of special education, teacher raises, and instruction. The Superintendent and the Board should be looking to make cuts elsewhere. My suggestion? Return public relations funding to 2012 levels as an austerity measure. Return legal staffing to an in-house team with a limited amount of money to spend litigating against parents. That should save a boatload of money right there. Please be aware. The HCPSS budget before the county council right now includes the expansion of elementary world language into 7 additional schools. We assume this means the Elementary School Model will be a component of this change. There has never been stakeholder input on completely changing the way our youngest students are taught, and this model reduces Art and Music by 25%, among other major changes. We believe that stakeholders deserve a say in this dramatic change, not to find it buried in a budget, whether you support it or not. And another thing: absolutely no data has been shared on the value of this model, whereas there is plentiful data on how a robust arts education benefits students from early childhood onwards. I know I've been exhorting you to get out the vote for Tuesday's election. That's a big job, and an important one. Please consider writing to your county council member today. They are now in the process of reviewing the budget. Ask them to halt funding for this expansion without community input. Ask that they endorse Mr. Kittleman's priorities in the school budget. Or better yet, go testify at the County Council meeting on Monday night. Can the County Exective direct spending in this way? Can the County Council get involved in the school budget in this way? These are questions most people thought we'd never even have to ask, but these are extraordinary times. And those are our tax dollars they are charged with spending responsibly. It is never inappropriate to request that our elected public officials do their utmost in the wise stewardship of our resources. Send a note, won't you? There's a festival in Ellicott City today--learn more here. I'll be home gargling hot salt water and feeling a tad sorry for myself. But if I have to be sick, at least I have a weekend for recuperating. I keep closing my eyes for "just a second" and realizing that I'm dozing off. Facebook tells me that the Little Caesars in Oakland Mills is now four years old. Locals say it can't hold a candle to Vennari's, but it fills a need in the community, so--yay! Today also marks thirteen years of service to the community for Oakland Mills Village Manager Sandy Cederbaum. I was privileged to work with Sandy when I served on the Village Board. We are so lucky to have her. Thanks, Sandy! Council Councilman Calvin Ball is celebrating ten years of service on the Council with an event this afternoon from 3-5 at the Ridgely Run Community Center. The County has announced that it has zeroed in on a site for the thirteenth high school, although some folks say that the location is actually nowhere near where the overcrowding is. Downtown Columbia will have a Bikeshare program. The azaleas are beginning to bloom at Brighton Dam Reservoir. The Primary Election is Tuesday, April 26th. Please vote, if you haven't already. Your voice matters! This week the Howard County School System has begun a much-publicized push to update their social media policy. Of course, it's easy for most of what they do to be "much-publicized" with the amount of money they spend on public relations personnel. And then there's all the free publicity they get just for being themselves. As I stated earlier in the week, I find this move to be rather hilarious. Here's why. Open letter to the community from Christine O'Connor which was really a letter to the editor of the Sun. Dr. Foose's open letter to the Howard County Delegation on her blog. 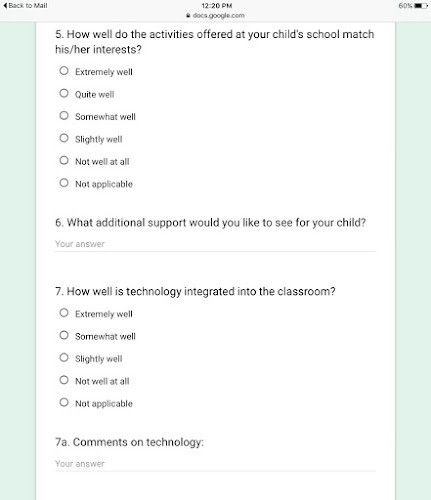 Christine O'Connor's "Fact Checking" post on the school system website and sent out to all parents as a part of schoolwide communications. In the most recent case, Ms. O'Connor uses school system social media platforms to attempt to put an official spin on issues which are currently being discussed and debated in an ongoing election. No matter how you slice it, this was done with the intent of influencing the outcome of the school board election. This is a flagrant attempt to discredit candidates who are challenging the incumbents. The Howard County Public School System has no business interfering with the Board of Education election. Period. In addition, it's just terribly done. My high school English teachers would have sent me back to the drawing board had I tried to get away with "fact checking" that includes no independent fact checking. Where are specific, comprehensive sources? As a friend of mine said in exasperation, "You can't fact check yourself." So, not only is this an example of unethical interference in an election, it's also an example of academically indefensible work. Not great for a school system. I'm not in the habit of throwing the Bible at people on this blog, but I in this case a certain verse seems particularly apt. I would heartily endorse an update to the school system's social media policy if they looked to clean up their own house first. In the meantime, you can help this endeavor along by voting on Tuesday for a better Board of Education, if you haven't already. Sometimes we all need a little push to do the right thing. Okay, maybe the school system needs a big push. You can help. Of course I have been urging you for quite some time to get and out vote in the Board of Education Election. (Today is the last day of Early Voting; then the Primary is Tuesday, April 26th.) But Heather is talking about Columbia Village Elections, which are Saturday, April 30th. She describes the odd situation in Oakland Mills where there are seven people running for seven seats, with the CA rep. again running unopposed. Voters are being encouraged to vote for two amendments which would do away for the need for elections under such circumstances. Rev'd Kirk-Davidoff outlines the effort needed to motivate residents to participate in village elections. For many years, the only accurate word to describe participation in Columbia and Village elections has been "dwindling". I have outlined in the past the reasons why younger and newer residents are turned off by the process and choose to stay away. Giving up on the election process altogether is not only an admission of defeat, it is an invitation to those in power to stay in power. It makes the representation of community members in our village even more of a private club than it already is. This isn't the way to go. I'd love to have seen a concerted effort to bring in new and under-represented voices into our Village leadership, rather than asking people to vote to fold up our tents and just stay home. Many thanks to Heather for addressing this issue. Something that has been weighing on my mind for some time is the fate of the employees who work in the Central Office of the Howard County School System. They, along with Department Heads whose offices may be elsewhere, and school administrators, are the most immediately affected by the decisions and behavior of upper level management. In a heavily top-down system, when the ball gets rolling, it rolls directly onto them. On February 4, 2016, were HCPSS administrators instructed via text message to remain in their chairs after the budget discussion? If so, why? Also, were school principals directed to attend the contract renewal meeting? If so, why? Were HCPSS personnel directed to testify regarding state legislation that would have elected future Board members by district? Did the Administration use HCPSS email to coordinate this effort? If so, please explain the educational interest in defeating this legislation. If not, please explain this video. Does HCPSS have a policy regarding the utilization of HCPSS personnel for political purposes? Is there a policy regarding the use of HCPSS e-mail for political lobbying, political speech, or coordination of political action? Can a principal or administrator be fired or demoted for failure to comply with a political directive? 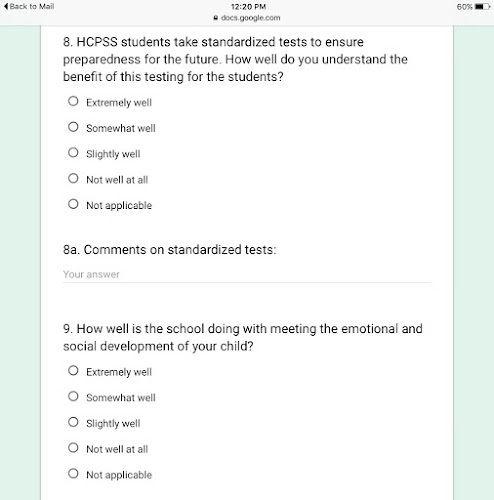 He puts these questions under the heading, Utilization of HCPSS Personnel for Political Purposes. I have another question. How many of these employees, when signing on to work for the school system, thought that they would be forced to be pawns in a political game which would pit them against teachers, parents, and the community? Who on earth would aspire to such a goal? Who would volunteer to be the enforcers of policies they did not choose and possibly did not believe in? Yes, I know, taking direction and "other duties as assigned" are always things that come with the job, but, as Tom Coale's piece outlines, just exactly what that means when it comes to hcpss has morphed into something that borders on malevolent. We take perfectly good people and ask them to commit professional malpractice. We appeal to the worst instincts of administrators who were once teachers and mold them into adversaries of their own communities. We take people whose moral and religious beliefs are rock solid and admired and we make them get up and lie to parents in public meetings. Why do they do this? Why don't they speak out, or just quit? We don't really know what goes on out there. I suspect that some have. But these are people just like us: they have families, mortgages, medical needs, maybe kids headed to college. They can't afford to leave a job if it means getting a bad reference. Could you? As much as we have a strong responsibility to our students, families, and teachers, we also have a responsibility to these people. Someone needs to be willing to give them a voice. I would hazard a guess that many of them are doing what they do motivated largely by fear. This environment of coercion and fear sets a tone which is bad for the entire school system. Please vote to bring new leadership to the Howard County Board of Education. We have a choice, and a responsibility, to do better than this. I'm resisting the urge to write about the Presidential race today. That's not really my department. I will say that I am open to reading why people love their candidate, and the qualities and qualifications that make that person the best. I am oh, so everlastingly tired of nasty smear articles about the candidates they don't like. These will convince no one and do nothing but spread ill will. Can we agree that we don't need any more ill will? The school system appears to have started some kind of initiative against irresponsible use of social media, which is kind of hilarious if you really think about it. I'll have more to say about that later in the week. Early voting continues through Thursday in Howard County. Vote! Tell your friends, neighbors, and coworkers that everyone, even unaffiliated voters, can participate in the Board of Education election. If you have already voted--thank you. I'm putting you in charge of motivating someone else. County Executive Kittleman has put money in the next budget for a new snow-plow tracker. Something in the order of 1.2 million. It's hard to think about that when yesterday was reaching up towards 80, but--what do you think? Do we need one? I think that, if it works, it's nifty thing to have when you're snowed in and trying to assess your options. Finally, my husband, Richard McCready, has written a book on creating your own music with music technology. It arrived from Amazon yesterday. We're pretty jazzed about it. I've written before about his commitment to reaching out to "the other 80 per cent" of kids who aren't involved in music by the time they reach high school. 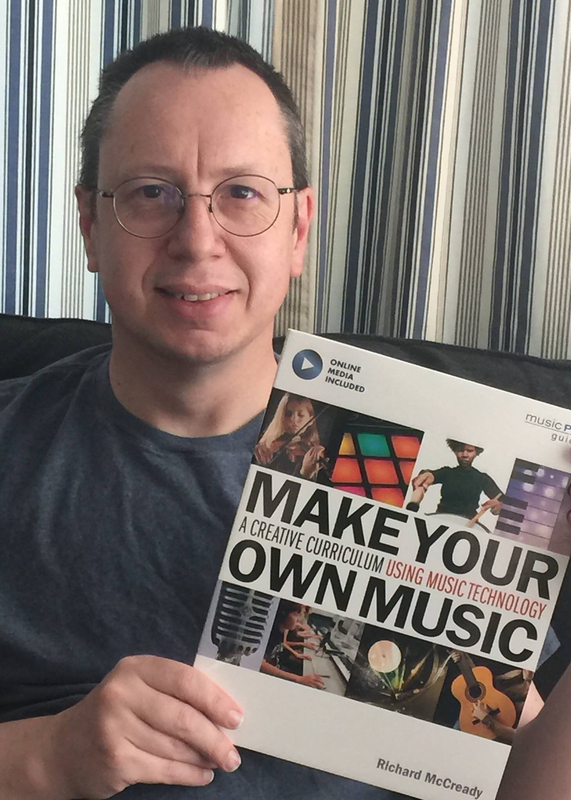 Music technology is an appealing and successful way to engage students who might think there's no place in music for them. A special HoCo Holler to him and to all the Howard County teachers who go the extra mile and find a way to do the best for their students. I came out of the Food Lion yesterday and the day was shaping up to be gorgeous. The sky was clear and blue, the sun was out, the air was gentle against my skin. It felt like--hmm--it felt like Farmers Market weather. I looked down at the other end of the parking lot and imagined all our familiar vendors in their places. Soon, really soon, I'll be coming over of a Sunday for fruits and vegetables, meats and cheeses, herbs, honey, baked goods, flowers and plants...even coffee and sometimes wine are available. In the past we've had live music, too. Folks come on foot, by bicycle, and by car as they make their weekly pilgrimage for the freshest and most seasonal foods on offer locally. The Oakland Mills Farmers Market is a place to bump into neighbors and friends, too. It's a safe space for parents to let their children wander around and investigate. On special days there are activities for children. People walk their dogs, and the dogs are generally pretty 'chill' and sociable. It's a neighborhood happening. Every Sunday. I love the OM Farmers Market. It's good for my neighbors, and it's good for my neighborhood. It draws not just from the Village, but from outside as well, since there are people looking specifically for a Sunday market, and they come to us. It's not unusual to see people combine a trip to the market with picking up a few things at the Food Lion. Customers from outside the Village take note of the Second Chance for a future trip, or finally figure out where The Other Barn is. Maybe they get pastries and eat in our beautiful courtyard. We don't get much "through traffic" in Oakland Mills so the Farmers Market is crucial for making new friends for the Village. That young couple who ventures out to our Sunday market, who comes back another evening to try the Second Chance--they're also passing houses for sale and thinking neighborhood and walkability. They're meeting and chatting with people who love living here. So the market is more than just a once a week stop for produce. It's a valuable investment in the present and future well-being of the Village. If you haven't been to the Oakland Mills Market, please accept my invitation to join us some Sunday. 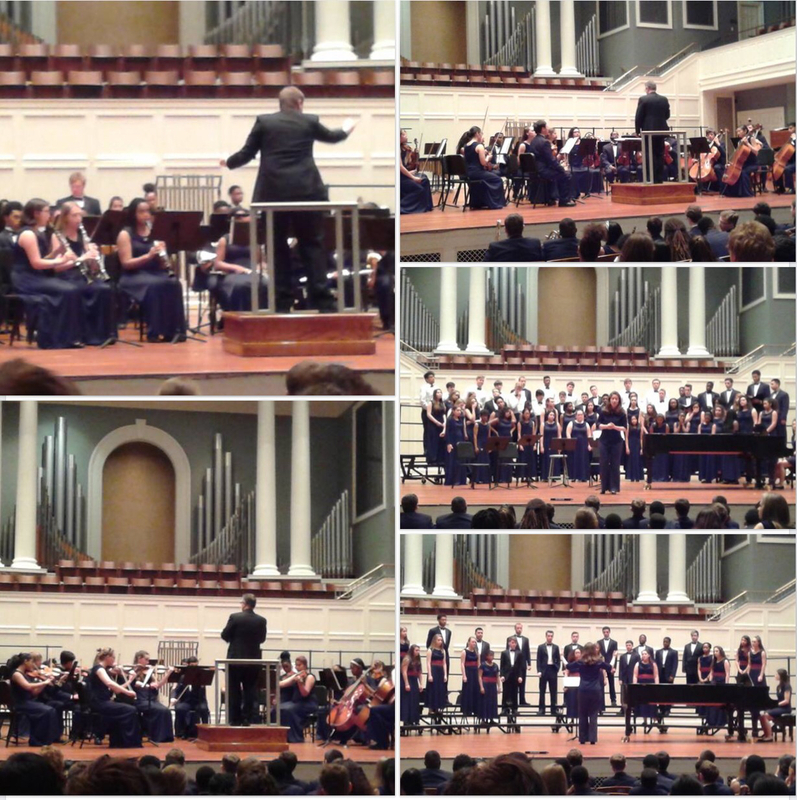 On December 8th I wrote a post entitled "The Other Side of Rouse" about the irony of the Oakland Mills High School Music Department giving a concert to benefit needy children while a substantial portion of their own members could not afford to go on their school trip to Nashville, Tennesee. As many of you know my children attend Title 1 schools, with very diverse and rich kaleidoscope of families. One of the most important things about Title 1 schools is that we have more lower-income families in our schools. This is true in Oakland Mills High School, yet it is also true that even if we go to the games with non-matching socks, or play our music with mostly lender instruments we still manage to get our name on the top. When our musicians attend to any kind of adjudication they usually come home with superior results. Our children are bright, determined and pushing boundaries to be able to start their young lives from the best possible point. Our parents, just like our students, are helping our school to success in every possible way, but at times like this we are falling short to support all of our students. Today I am standing before you and asking money to allow 15 of my music students ($645.00 for each student) to be able to go to our school’s bi-annual trip to experience playing in a huge university auditorium, experience campus life, talk with current students and lecturers in Nashville, Tennessee in Spring 2016. Our Fine Arts Boosters work really hard to support as many of these students as possible, alas as Title 1 school parents, our pockets are going only so far, and these 15 students themselves have not many other way of raising this money. Please remember; for many of these students this will be the first time in their lives where they will experience –however short it may be, and in some cases may be the only time- a university life. Remember this can be the experience this 15 students need to make that one important contact, that will open doors for them, that may have not be possible before. Since I shared this on the blog, and appealed to my readers to help out, I wanted to share the outcome. This weekend Mrs. Faust has accompanied the music students on their trip. She's been sending photos and updates along the way. I wish I could bring the actual sound and feelings flowing through this wonderful venue. You, like many of us here, for sure couldn't help but swell with joy and pride. Thank you Oakland Mills for supporting our children. Because of your support of; love, time and money these kids showed what a wonderful place Oakland Mills is to Nashville, TN! The "diverse and rich kaleidoscope" of Columbia ventures out into the world, sharing the gift of music. Thanks to all of you who invested in their journey. 1. Klein is consistently critical of the Columbia Association. He attacks it for not representing residents, not adhering to Rouse's vision, not operating transparently. 2. Klein demands return of "Symphony Woods" to "CA control." This makes no sense. After spending so much time and effort convincing us that the Columbia Association is not to be trusted, why on earth would voters wish to entrust them with the care of Merriweather Park in Symphony Woods? You just can't have it both ways, Mr. Klein. In being so thoroughly critical of everything, Mr. Klein's underlying message seems to be: give control of CA to me. Give control of Symphony Woods to me. No one else can be trusted. Life experience has taught me to run from people who operate like this. Oh, and one more thing. I find it extremely odd that Mr. Klein, a champion of honesty and transparency, has been leaving comments on this blog under an assumed name. The ColumbiaWatcher account was ID'd by the late blogger Dennis Lane in February of 2013 as belonging to Alan Klein. Yes...it is about control. Klein is fighting to keep community control of Symphony Woods through the Columbia Association, our HOA. Fontaine is fighting to keep Symphony Woods in the control of a private corporation (the Inner Arbor corporation) with no transparency or accountability to the community. I am with Klein! ColumbiaWatcherAnd I would say that every time you demonize others by assuming you know what they want and what they intend to do ("those who wish to 'Deify the past. Control the Future.'" or "a narrow band of self-styled protectors") you show how little you really understand the spirit and values of Columbia and Columbians. Can we just pause for a moment to let the irony of this sink in? Mr. Klein thinks I don't understand much about the spirit and values of Columbia. Well, it's safe to say that I know full well that skulking about on local blogs under an assumed name is not the picture of transparency and accountability. If you live in Harpers Choice, please do not vote for this man. Tell your friends. His opponent Bob Fontaine is highly qualified, experienced, and known for working well with others. And he puts his own name on all his work. There's a party tonight in Ellicott City and if you're a blogger, a blog reader, or just love to follow the HoCo scene on social media, you should go. It's from five to seven pm at HorseSpirit Arts Gallery. Sign up here. I'd love to go but I work late these days. My Friday night plan involves flopping on the couch and eating leftovers or takeout. You can do better. Go to the party and then tell me how it went. Speaking of parties, I had the honor of attending the Howard County Schools Friends of Education reception yesterday afternoon, in support of Vicky Cutroneo. 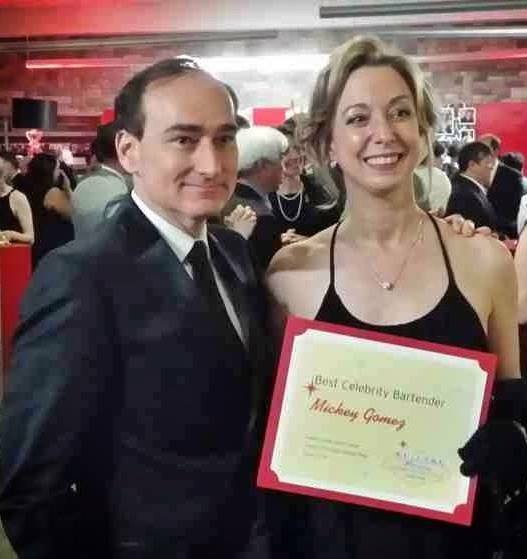 Vicky was recognized as a nominee for the award. 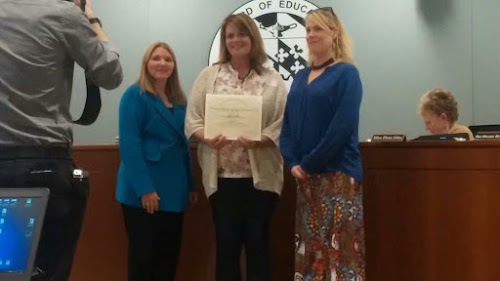 You may recall that I nominated her for her work in creating "Mold in Howard County Schools--Information for Parents" and her advocacy on behalf of students, parents, and staff. Here she is receiving her certificate, flanked by Superintendent Reneé Foose and Board Chair Christine O'Connor. It was a lovely event with punch, cookies, fruit, and plenty of good words about members of our community who give of their time and talents to support our schools. I was glad to have attended, although I just say there's something very odd about the Board of Ed room now that they've remodeled it. There appears to be substantially less room for public seating. Lovely altar at the front, though. In closing, for those of you who are looking for something less like a party or a reception, and more like a happening, Early Voting is for you. It's free, you have your choice of locations and days, and you get a sticker. You, too, can be a friend of education. All you need to do is vote for a better board of ed. Village Green/Town² : So, Local Man. It would be great to do a one-year follow-up on your remarkable achievement. Do you have any insights or updates you'd like to share? Local Man: It has been a fantastic year. I've walked to work at least twice per week, excluding some of the really cold months of winter. Village Green/Town² : What keeps you going? Local Man: The realization of the beauty of my Village. Working in a community I love. Lunches with my wife and daughter help, too. Village Green/Town² : Any downside? Local Man: Well...the worst thing is that the air pollution of car exhaust is more apparent when you walk! Village Green/Town² : Have you been able to shave any time off of your seventeen-minute record? Local Man: Looking at my fitbit, it looks like I got it down to 15 minutes, but I normally keep a casual pace. Village Green/Town² : After a year of almost continuous training, would you say that you're still happy to be following in the footsteps of Columbia Man? Local Man: Absolutely. I'd say it has been a mighty fine 12 months. Mighty fine, indeed. "Why This Election Matters" by Bill Woodcock, The 53. "Sweeping changes are needed on the county's school board" by editorial staff, Howard County Times. Continuing my post from yesterday--where was OMHS Alpha Achievers' Faculty Sponsor when this lovely photo was taken? We are processing your last salary invoice for the year, and I want to thank you for all your work. We have now reached the amount that we were able to allocate for your work at Oakland Mills. I will be contacting the principal for directions regarding the upcoming school year. Please feel free to volunteer your time and talents at Oakland Mills. However, if any essential functions surface for which Oakland Mills needs representation, let me know. This was before Spring Break. Hmm. Let's think. We have a retired Howard County Teacher who helped found this organization, who didn't want to retire because he cared so much about what would happen to Alpha Achievers at Oakland Mills High School, and you let him know you are done paying him via email. Feel free to donate your time, though. I find this to be profoundly disrespectful, both to Mr. James and his students. How much commitment are we showing to the Alpha Achievers if we basically kiss off their sponsor with three months of the school year left? I guess we don't truly value the group or its mission all that much. Is it any wonder that some people have come to wince when they hear the oft-touted "World Class" claim? World Class is as World Class does. And this, my friends, is just not doing it. You can see the mindset that allows students fall through the cracks when it is equally apparent that we are doing the same to teachers. 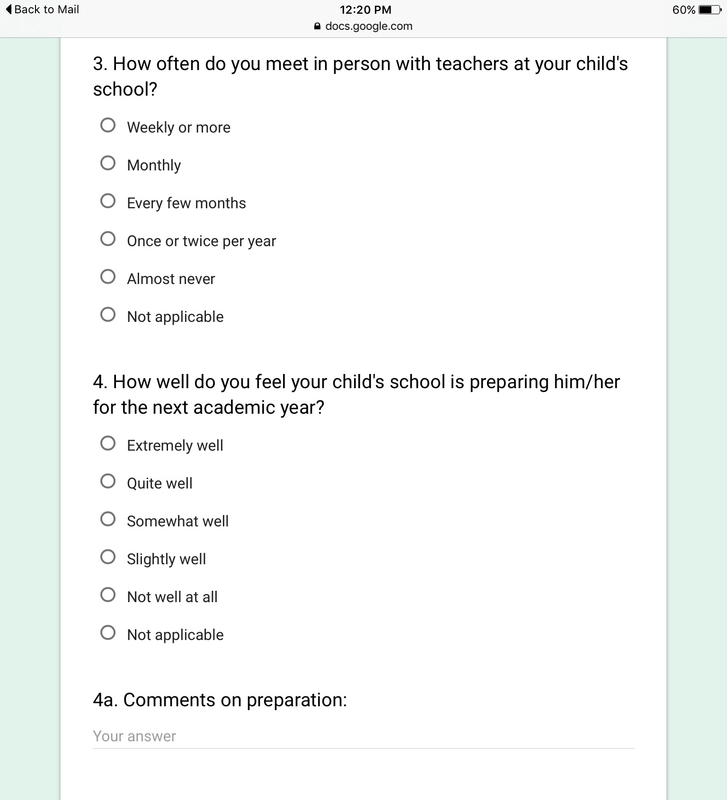 That abysmal Teacher Job Satisfaction Survey? Not too surprising. In the meantime, parents who have reached out to the principal at OMHS have been told that "there may be some misunderstanding" about Mr. James and that they're "finding the money" to keep him on. However, as of yesterday no official announcement has ever been made to parents and they are in the dark as to whether Mr. James is returning. Well, this seems like a good time to have the Superintendent and Chair of the Board of Education stop by and have their pictures taken against the backdrop of hastily assembled Alpha Achievers. This morning's mystery comes in the form of a photograph. Rather like a hidden picture or a seek-and-find, this picture tells a story worth investigating. You know who is missing from this picture? Mr. Vincent James, one of the founders of Alpha Achievers in 1997 and the coordinator of Alpha Achievers at Oakland Mills High School. Let me tell you a little bit about Mr. James. Mr. James teaches the GT Research Program at Oakland Mills High School, guiding interns and independent researchers to pursue their passions and prepare for life after high school. In 1997, he helped found the Alpha Achievers, an honors organization for young minority males. He has served as the Alpha Achievers advisor since, and has been an instrumental role in expanding the organization to every school in Howard County. Mr. James has also advised the Student Government, and taught African American studies at Oakland Mills. I don't understand why Mr. James would have been left out of this beautifully staged photo opportunity. Alpha Achievers means the world to him. In fact, I've heard from parents that he almost didn't retire because he was so worried about the future of Alpha Achievers at Oakland Mills. That's dedication. So, in an administration that urges us to focus on "what is strong", where is the Alpha Achievers' strong leader? Answers, anyone? Also, what special event was the Superintendent commemorating? I'd love to learn more. How long have you lived in Columbia? Okay, maybe they're just trying to start a conversation but, oh my heavens, it is time to stop asking that question. It is the litmus test to everything in this town. If you go to any sort of community meeting, whether Village, or CA, or one focused around a particular subject, it is the hurdle one must jump over to participate or even express an opinion. "Oh really? Well, how long have you lived here?" Do you vote in Village and CA elections? The Columbia Assocation website states that CA is "Working every day in hundreds of ways to make Columbia an even better place to live, work and play." And I believe that. I really do. But please, please, please stop asking me how long I've lived here. On Friday a friend of mine shared this message on Facebook and it's very much an accurate description of my state of mind right now. Change is messy. Growth is difficult. Sometimes it hurts a lot. Sometimes we feel alone in it. It is all part of the journey and if we stick with it - sometimes skipping, sometimes tripping down that path - I am certain we will find beauty and goodness. Tomorrow we'll be back to the workday/school day schedule and perhaps the way forward will be supported by the comfort of well-worn routines. In the meantime, here's a cute story about a duck. Reaching outside the Bubble today. The issue of so-called "Bathroom Bills" in places like North Carolina targeting transgender citizens and denying equal protection under the law to LGTBQ persons is not something I can ignore. Apparently Bruce Springsteen feels the same way, having canceled his concert in North Carolina in response to the passing of House Bill 2, the Public Facilities Privacy & Security Act. As an early childhood educator, one of the first things I learned about was the concept of logical consequences. Rather than "punishing" a child for being "bad", one allows them to experience the consequences of their own actions. "Effective consequences will tend to be ones that naturally follow from the misbehavior, or which are logically related to the misbehavior. Naturally or logically connected consequences mimic the way consequences actually work in the real world, and therefore make intuitive sense [to children.]" A boycott of a state that enacts laws which violate the civil rights of its citizens is, quite simply, the logical consequence of the state's own actions. Think of this in a small way. If a local business provide poor service, or a bad product, customers may very well chose to take their business elsewhere. Now think of this in terms of the Civil Rights struggle in the 1960's. The Montgomery Bus Boycott was a direct consequence of the outrageous treatment of African American citizens by the bus company. Acts such as sending blacks to the back of the bus or refusing to serve them at lunch counters or making it almost impossible for them to vote were all entirely legal. But they were wrong. They were a violation of what our country was created to stand for. When citizens responded by refusing to ride the bus or staging sit-ins at lunch counters the powers that be were quick to point out the financial losses and inconvenience their actions were incurring. They used multiple methods both legal and illegal, honest and dishonest, to disable the resistance. When politicians write bad laws that consolidate power for the privileged and oppress the civil rights of others, no one should remain silent. Speaking out lets LGTBQ citizens know they are not alone. In addition, acting on our beliefs to "take our business elsewhere" is not some vindictive or mean-spirited "punishment". It is simply the natural consequence of these law-makers' bad actions. It's the free market at work: I'm not buying what you are selling. If you want my business, you're going to have to up your game. Specifically, that would mean "liberty and justice for all." 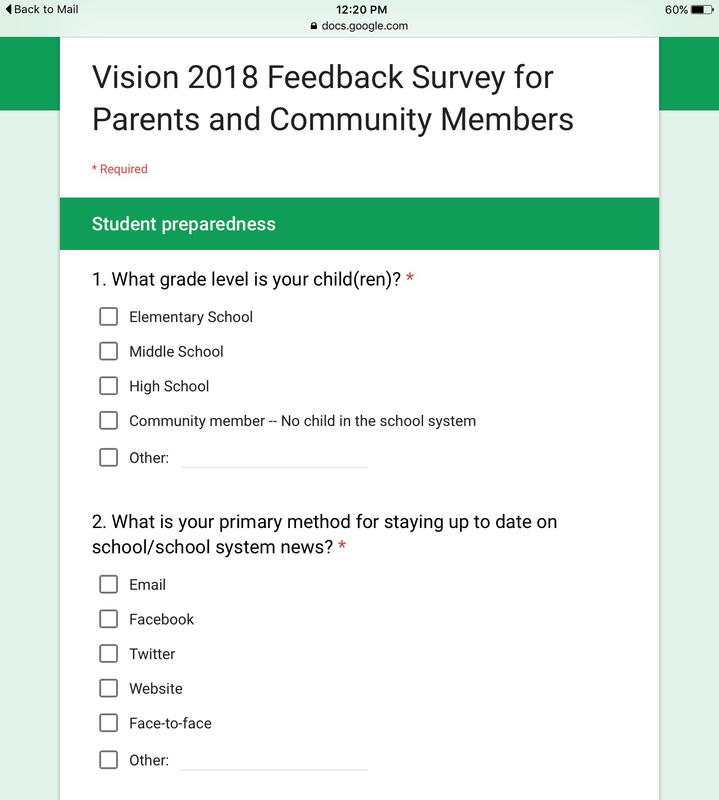 Please take a look at this survey offered to parents and community members for input. Comments? Questions? Suggestions? There's also a feedback session Monday evening at Oakland Mills High School, which conflicts with a Board of Education candidate forum. If you choose up to go in person, or already went to the one this week which conflicted with Monday's PTACHC forum, I'd be interested in your impressions and insights. What does that even mean, "many happy returns of the day"? I've never really thought about it. A quick search reveals that it is intended to wish the recipient many such happy days in the future, many happy birthdays, not just this one. Makes sense. Local luminary Mickey Gomez has a birthday today. I have a suggestion: celebrate her birthday by paying a visit to her blog, Life and How to Live It. Her latest post is about Spring and spiders. You should check it out, although it may change your feelings about venturing into your own back yard. 2. What response did BOE member Ellen Giles get from the ethics panel about Ann DeLacy's use of hcpss emails to solicit campaign donations? 4. Why did two of the three incumbents refuse to be interviewed for a story which highlighted the public's frustration over lack of openness and transparency? Doesn't that kind of...prove the point? 5. What on earth does it mean to be "reliably black"? He didn't have to say anything. It was not required of him to speak out. It would have been easier to say nothing. And yet he took the risk of speaking out and giving a voice to many who are voiceless. Yesterday I was stunned by this post from Councilman Jon Weinstein. April is Sexual Assault Awareness Month... an issue that knows no boundaries. Something few people know about me is that I was sexually assaulted in high school by a teacher I trusted. It took me several years to come to terms with it when I learned that another student was assaulted and the teacher was going to trial. At that time nobody knew what had happened to me. I struggled with telling my wife (with whom I went to high school and she knew the teacher), my parents, and my siblings because I was ashamed and embarrassed and didn't want anyone to think less of me. The one thing that pushed me to break my silence was my newborn son, Zach. Even though he couldn't utter a word, I could hear in my head the conversations we would have as he grew - like assuring him that he could tell me and his mom ANYTHING, and that you should always try your hardest to do what was right even if it was the hardest thing to do. That night I told Margaret and my parents; the next day I called the prosecutor and asked to testify... a decision I will always be glad I made. Please raise your voice to stand up for survivors of sexual assault... or for any cause that matters to you. Please share this video with friends and family and consider what we all can do to support survivors and combat this societal scourge. As a public servant, Mr. Weinstein is called upon to advocate for all sorts of people whose needs he may not necessarily share. He can work on a plan to provide after-school buses, for example, without having experienced the need for them. It is his responsibility to put himself in other people's shoes. The public understands that a politician will speak to a wide variety of issues simply as a part of his job. But this one was personal. It would have been far easier, I think, to make the standard announcement and move on. Revealing himself as a victim of sexual assault took courage. Because as brave as it was, it comes with it an admission of vulnerability. Politicians don't usually seek out that territory--especially not men. It's a risk. It's a risk Mr. Weinstein chose to take. I find this particularly heartening as we have a serious problem right now in Howard County with how the school system handles victims of sexual assault. This could have not come at a better time for victims and their families. They need a voice. Survivors of sexual assault in Howard County can get in touch with HopeWorks for counseling and services. Now they know they have a friend in local government who knows, who really knows, what it's like to be in their shoes.